Software development is all about tradeoffs and microservices are no exception. What you gain in code deployment and operation independence, you pay for in performance overhead. This section provides some recommendations for steps that you can take to minimize this impact. Microservices are particularly well-suited to entities that are accessed with the create, retrieve, update, delete (CRUD) pattern. When working with such entities, you typically use only one entity at a time, such as a user, and you typically perform only one of the CRUD actions at a time. Therefore, you only need a single microservice call for the operation. Look for entities that have CRUD operations plus a set of business methods that could be utilized in many parts of your application. These entities make good candidates for microservices. The App Engine SDK supports many batch APIs, such as the ability to fetch many entities from Cloud Datastore through a single RPC, so servicing these types of batch APIs can be very efficient. Often, you will need to interact with many microservices to compose a response. For example, you might need to fetch the logged-in user's preferences as well as their company details. Frequently, these pieces of information are not dependent on one another and you could fetch them in parallel. The Urlfetch library in the App Engine SDK supports asynchronous requests, allowing you to call microservices in parallel. A custom domain causes a different route to be used when routing through the Google infrastructure. Since your microservice calls are internal, it's easy to do and performs better if you use your my-app.appspot.com hostname. Explicitly set follow_redirects=False when calling Urlfetch, as it avoids a heavier-weight service designed to follow redirects. Your API endpoints should not need to redirect the clients, because they are your own microservices, and endpoints should only return HTTP 200-, 400-, and 500-series responses. There are good reasons to use multiple projects when building a microservices-based application, but if performance is your primary goal, use services within a single project. Services of a project are hosted in the same datacenter and even though throughput on Google's inter-datacenter network is excellent, local calls are faster. It's bad for performance to use security mechanisms that involve lots of back and forth communication to authenticate the calling API. For example, if your microservice needs to validate a ticket from your application by calling back to the application, you've incurred a number of roundtrips to get your data. An OAuth2 implementation can amortize this cost over time by using refresh tokens and caching an access token between Urlfetch invocations. However, if the cached access token is stored in memcache, you will need to incur memcache overhead to fetch it. To avoid this overhead, you might cache the access token in instance memory, but you will still experience the OAuth2 activity frequently, as each new instance negotiates an access token; remember that App Engine instances spin up and down frequently. Some hybrid of memcache and instance cache will help mitigate this issue, but your solution starts to become more complex. Another approach that performs well is to share a secret token between microservices, for example, transmitted as a custom HTTP header. In this approach, each microservice could have a unique token for each caller. Typically, shared secrets are a questionable choice for security implementations, but since all the microservices are in the same application, it becomes less of an issue, given the performance gains. With a shared secret, the microservice only needs to perform a string comparison of the incoming secret against a presumably in-memory dictionary, and the security enforcement is very light. If all of your microservices are on App Engine, you can also inspect the incoming X-Appengine-Inbound-Appid header. This header is added by the Urlfetch infrastructure when making a request to another App Engine project and cannot be set by an external party. Depending on your security requirement, your microservices could inspect this incoming header to enforce your security policy. As you build your microservices-based application, you begin to accumulate overhead from successive Urlfetch calls. When this happens, you can use Cloud Trace to understand what calls are being made and where the overhead is. Importantly, Cloud Trace can also help identify where independent microservices are being serially invoked, so you can refactor your code to perform these fetches in parallel. A helpful feature of Cloud Trace kicks in when you use multiple services within a single project. As calls are made between microservice services in your project, Cloud Trace collapses all the calls together into a single call graph to allow you to visualize the entire end-to-end request as a single trace. 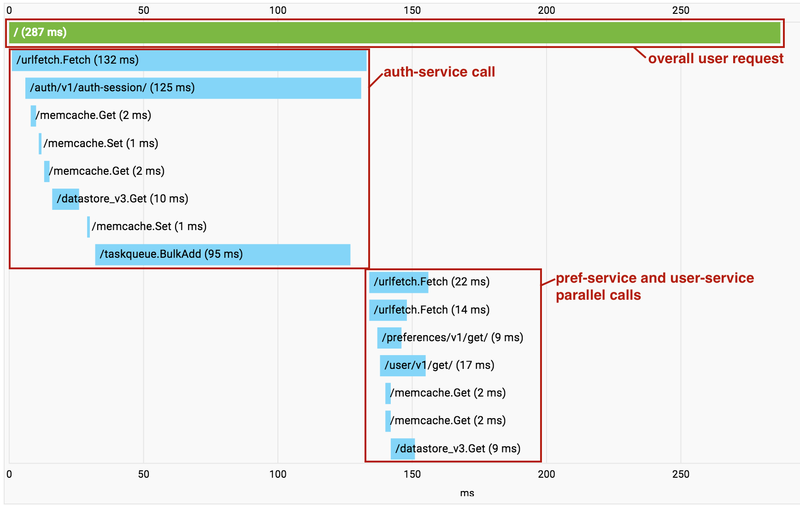 Note that in the above example, the calls to the pref-service and the user-service are performed in parallel by using an asynchronous Urlfetch, so the RPCs appear scrambled in the visualization. However this is still a valuable tool for diagnosing latency. When designing your API responses, it's helpful to include the unique request ID in the boilerplate response that you give back to the caller. This approach can tie client requests together with microservice responses and help with debugging and diagnosis. Other helpful items are the hostname, path, instance ID, and the version that served the response. All of this information can be found on the request environment so it is inexpensive to include in the response.